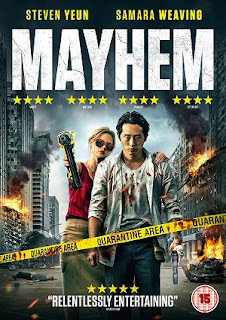 Realm of Horror - News and Blog: MAYHEM arrives on UK DVD this month!!! Fresh from raucous, sold-out festival screenings across the globe, Kaleidoscope and SHUDDER are excited to announce the UK digital and DVD release of the stylish and savage MAYHEM – the brilliantly executed action-horror-comedy which sticks two fingers up at office politics and then proceeds to rip out the charred heart of humdrum 9 to 5 society today. Derek Cho (Steven Yeun -The Walking Dead) is having a really bad day. After being unjustly fired from his job, he discovers that the law firm’s building is under quarantine for a mysterious and dangerous virus. Chaos erupts throughout the office as the victims of the disease begin acting out their wildest impulses. Joining forces with a former client (Samara Weaving, Ash vs Evil Dead) who has a grudge of her own, Derek savagely fights tooth and nail to get to the executives on the top floor and settle the score once and for all. MAYHEM received its World Premiere at the 2017 South by Southwest Film Festival to critical praise followed by sold-out international screenings including Fright Fest and the aptly named Mayhem festival in 2017. The film is already available on Digital Download and is released to UK DVD July 16. The film will also be available to stream on SHUDDER TV in the Autumn.